Regular readers know that the two things that get me most excited are the Georgia Bulldogs and the fight against a bloated public sector that is ineffective in the best of circumstances and more often than not is a threat to our freedoms. So you will not be surprised to know that I am delighted that former Georgia Bulldog star Fran Tarkenton (who also happened to play in the NFL) has a superb piece in the Wall Street Journal ripping apart the inherent inefficiency of government-run monopoly schools. Here is the key passage. Imagine the National Football League in an alternate reality. Each player’s salary is based on how long he’s been in the league. It’s about tenure, not talent. The same scale is used for every player, no matter whether he’s an All-Pro quarterback or the last man on the roster. For every year a player’s been in this NFL, he gets a bump in pay. The only difference between Tom Brady and the worst player in the league is a few years of step increases. And if a player makes it through his third season, he can never be cut from the roster until he chooses to retire, except in the most extreme cases of misconduct. Let’s face the truth about this alternate reality: The on-field product would steadily decline. Why bother playing harder or better and risk getting hurt? No matter how much money was poured into the league, it wouldn’t get better. In fact, in many ways the disincentive to play harder or to try to stand out would be even stronger with more money. Of course, a few wild-eyed reformers might suggest the whole system was broken and needed revamping to reward better results, but the players union would refuse to budge and then demonize the reform advocates: “They hate football. They hate the players. They hate the fans.” The only thing that might get done would be building bigger, more expensive stadiums and installing more state-of-the-art technology. But that just wouldn’t help. This sounds absurd, of course, but Mr. Tarkenton goes on to explain that this is precisely how government schools operate. If you haven’t figured it out yet, the NFL in this alternate reality is the real-life American public education system. Teachers’ salaries have no relation to whether teachers are actually good at their job—excellence isn’t rewarded, and neither is extra effort. Pay is almost solely determined by how many years they’ve been teaching. That’s it. After a teacher earns tenure, which is often essentially automatic, firing him or her becomes almost impossible, no matter how bad the performance might be. And if you criticize the system, you’re demonized for hating teachers and not believing in our nation’s children. 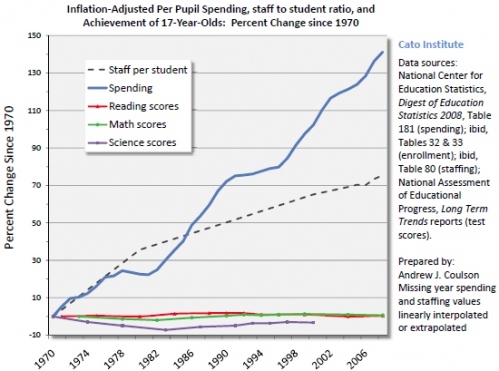 Inflation-adjusted spending per student in the United States has nearly tripled since 1970. According to the Organization for Economic Cooperation and Development, we spend more per student than any nation except Switzerland, with only middling results to show for it. Actually, I will disagree with the last sentence of this excerpt. 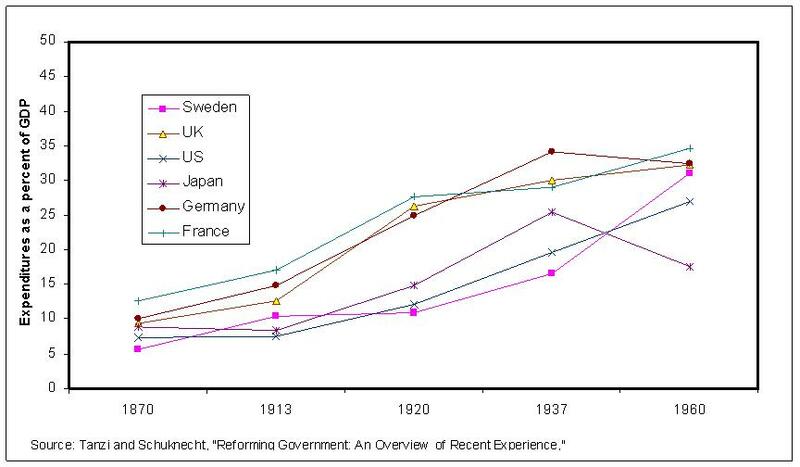 We’re not even getting “middling results.” Here’s a chart from an earlier post showing that we’ve gotten more bureaucracy and more spending but no improvement over the past 40 years. So what’s the solution to this mess? Well, since government is the problem, it stands to reason that competition and markets are the answer. Sweden, Chile, and the Netherlands are just some of the countries that have seen good results after breaking up state-run education monopolies.